Sure, you can go to your local greenhouse or farmers’ market and buy seedlings to plant in your container garden. But your choices are going to be limited to what those greenhouses and farmers think will sell the best. If you want to grow something that’s a bit out of the ordinary, your best bet is to buy the seeds and start them yourself. It’s not terribly complicated as long as you understand the process. There are four basic things you need. Anything that will hold soil works. Use cell packs (these are usually sold in six-packs), yogurt containers, or plant pots made of compressed peat or other materials that break down in the soil. If you’re reusing plant pots from last year, you’ll need to clean and sterilize them in a solution of 1 part bleach to 9 parts water. This will prevent the recurrence of any diseases your garden may have had last year. You don’t want to just go dig up some dirt or reuse the soil from last year’s container gardens. Seeds can be very delicate, and they need a sterile, light and fluffy seed-starting mix that holds just enough water to keep them hydrated. Your best bet is to use bagged seed-starting mix or buy compressed peat pellets. Fertilizer isn’t important in your seed-starting mix because seeds contain the nutrients the seedlings will need in order to grow. Seedlings need a lot of light in order to be healthy and strong. If you’re not too far north, a south-facing window with lots of sun might be okay for some plants. But you’re probably going to need to use some kind of artificial light. For information on how to set up lights to grow your seedlings, visit the Burpee Seeds website. Your seeds will need enough water to germinate, but not so much that they drown or get moldy. The best way to determine if your seedlings are getting enough water is to water the seeds from the bottom, using a tray that will hold your seedling pots. If you water from the top, you risk having your seeds get moldy. If your seedlings are wilting, they’re not getting enough water. If they’re looking pale, they may be getting too much. Especially in the northern latitudes, you may need to keep your seedlings warm enough for them to grow. During germination, when the seeds initially start to grow, they’ll need some gentle warmth. Try setting the seedling containers on top of a refrigerator or a dryer, or by making a bench for them a few inches from a radiator. 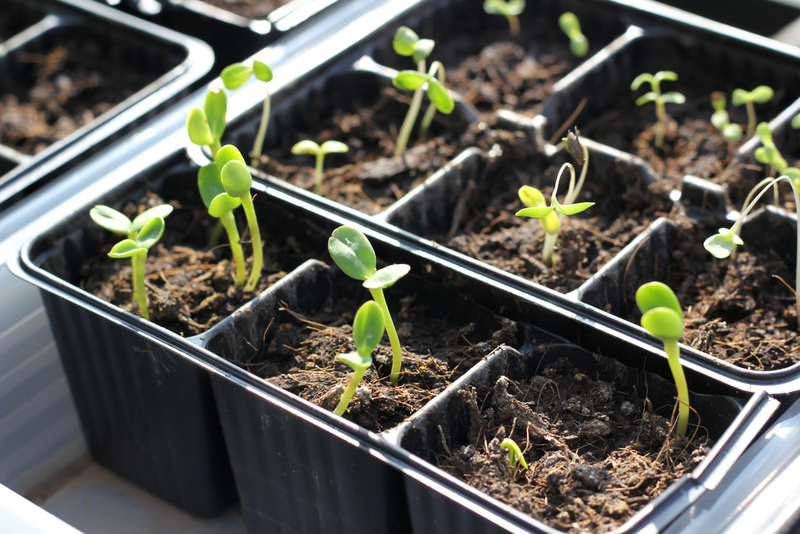 Once the seeds have sprouted, they can be moved to a slightly cooler—but not cold—area. Have you started seeds before? How did it work out for you? What tips would you offer a gardener who wants to start their own seeds? Please share your thoughts in the comments. This entry was posted in gardening, Home Gardens, Rooftop Gardens and tagged container gardening, home gardens, seed starting, seedlings, urban gardening, urban gardens. Bookmark the permalink.